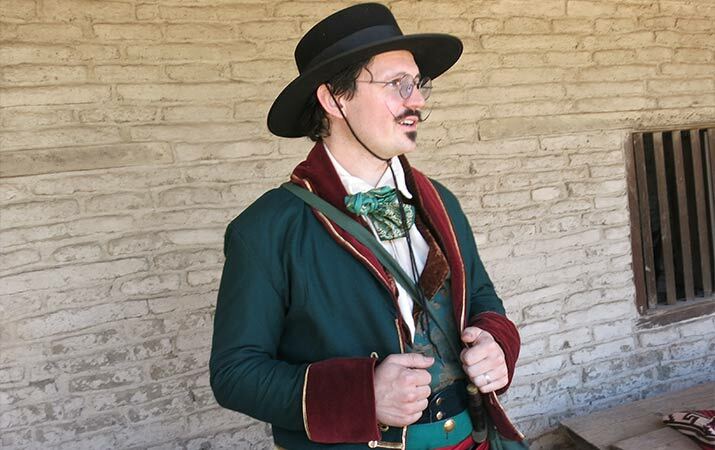 Step back in time to 1840, when California was a province of Mexico. This is the Rancho de Petaluma, the working ranch of General Mariano Guadalupe Vallejo. On the ranch are raised thousands of cattle and sheep and crops such as corn, barley and wheat. The primary business is trading cowhides and tallow to merchants that arrive by ship. The rancho is also busy with daily activities – cooking in the beehive ovens and over wood fires, making candles, weaving wool into clothing and blankets. 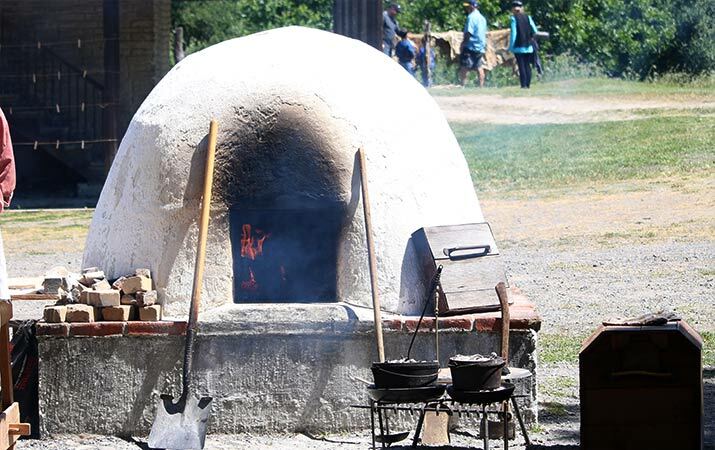 On Living History Day at the Petaluma Adobe, volunteers dress up in period clothing, and kids will have fun with hands-on activities: write with a quill pen, weave a basket, stamp designs on leather, try a loom, rope a “bull,” sample just-cooked bread, play a 19th century wooden toss game. 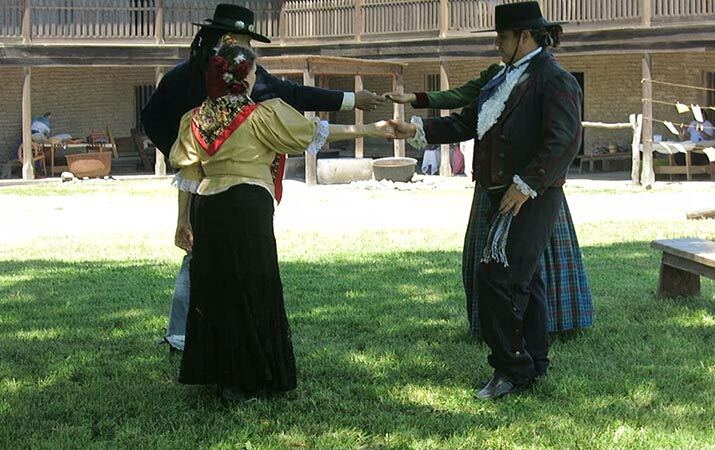 Also, ask the volunteers about what life is like 150 years ago, listen to music, and join in traditional dances. First stop, the beehive wood-fired ovens were blazing away. Turns out, the bread baking wasn’t cooked in the oven, but in cast iron Dutch oven pots, with coals from the oven fires. We sampled the delicious fresh bread, slathered with butter. Nearby, a woman prepared three dishes, chopping all the fresh ingredients (hard boiled eggs for the salad came from her own chickens), and cooking in pots on set on a grill over a wood fire. She made “rez adobo,” a slow cooked beef dish from a Vallejo family recipe, California potato salad (potatoes were boiled then fried, pickles, hard boiled eggs, green onions, colorful red and orange peppers), and a rice dish with green beans. It’s a real skill to cook over a fire, without burning the food. 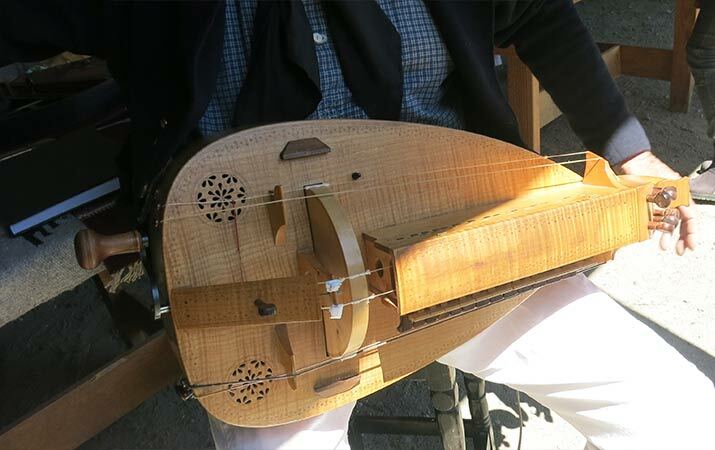 The zanfona is a stringed instrument, with a wheel that’s turned and a keyboard. It’s an ancient instrument, popular for folk music throughout Spain. What’s fascinating, depending on how the musician plays the zanfona, it can sound like a bagpipe one minute, a fiddle the next! With a display of Native American artifacts, a volunteer described the Coast Miwok, who lived in this valley before the arrival of the Spanish. For the Miwok, food was plentiful (acorns, fish, meat, seafood). 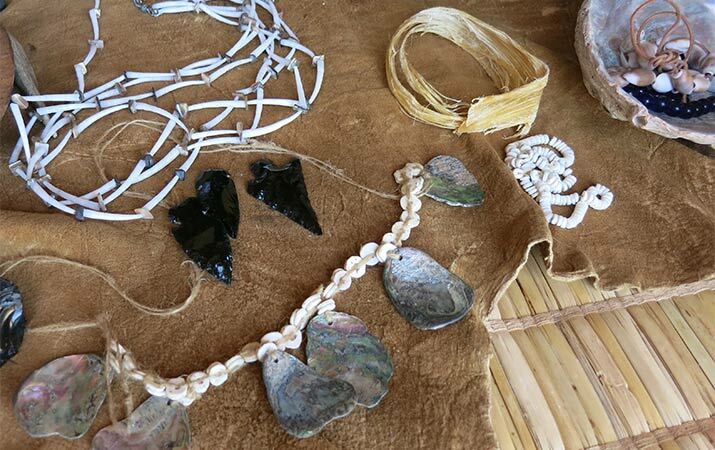 Craftsmen made abalone ornaments and shell beads to trade, e.g. for black obsidian points from Native Americans inland. 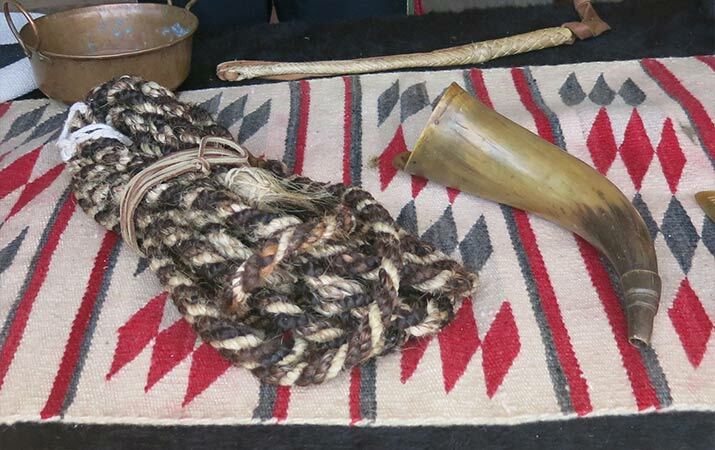 These are typical products made in the pueblo of Sonoma around 1840 – tanned cowhides, rope made from horsehair or rawhide, watertight powder and salt horns, combs and spoons, moccasins, blankets. Merchants arrived in sailing ships to do business with the people of Sonoma. 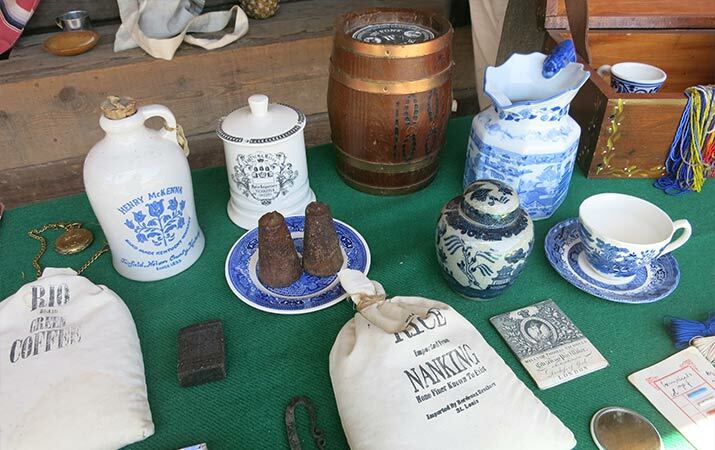 Cowhides and tallow were traded for items not available locally – silk from China, fine cloth from India, cups and plates from the Netherlands, cones of sugar, rice, coffee, gunpowder, thread, tobacco. Out in the grass, kids could try roping a hay bale with bull figure, or play a 19th century game, called “Graces,” played with two wooden sticks and a small hoop. Hold the hoop in two crossed sticks, and toss the hoop to another player, who catches the hoop with two crossed sticks. Throughout the afternoon we watched dances, some were accompanied by the musician playing the zarfona, such a versatile instrument. 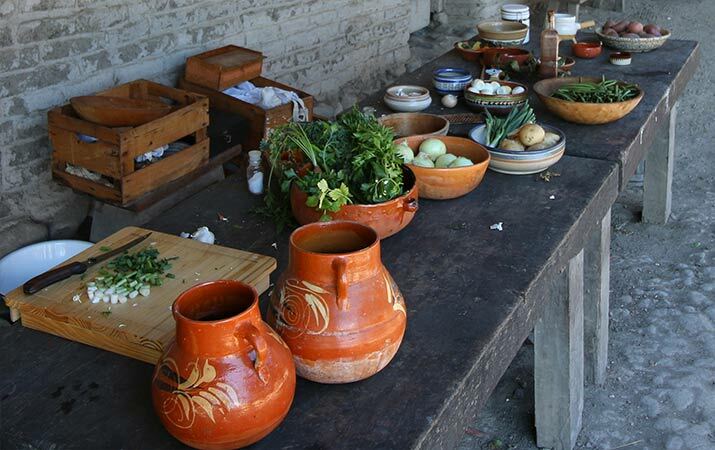 Tip: Be sure to visit the interior of the Petaluma Adobe, a two story adobe house, with storerooms for grain and hides, leather working room, weaving room, living quarters for servants and artisans, bedroom and dining room for the Vallejos. 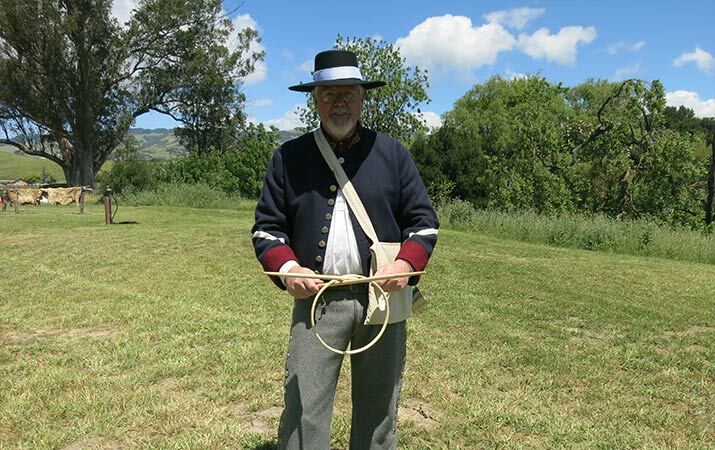 And read about more fun things thing to do with kids in the Sonoma Valley on Travel for Kids.